The Golden State Warriors cannot be criticized for lacking ambition. Mark Jackson led the franchise to the playoffs in two consecutive seasons (out of his three total), a feat that made him their most successful head coach since the first Don Nelson era. His reward was a speedy dismissal. For whatever tensions existed between Jackson and his bosses — and there were many, to the point where a disaster may have loomed — it is fairly apparent that the people in charge of the Warriors expect to challenge for titles, not to lose out on homecourt advantage in the first round and take one playoff series every couple years. Owners Joe Lacob and Peter Guber want one of the league's preeminent franchises. The question isn't only if they have the roster to get them there, but whether they have hired the right man for the job. Former Phoenix Suns general manager, TNT commentator, and golfing buddy Steve Kerr has no coaching experience of any kind, just like Jackson when he was hired in 2011. Yet there's no guarantee that the Warriors will get lucky twice, even if Kerr has a sterling reputation and has said all the right things so far. The Warriors have taken a gamble, again, and Kerr may not connect with his players as well as Jackson did in his three seasons with the club. However, Kerr and his staff (which includes Alvin Gentry, his coach in Phoenix) can improve the team in other ways. It will take some work to match last season's third-ranked defense (by points allowed per possession), but there is a clear opportunity to best a No. 12 offense that belied Golden State's reputation as an especially potent group. While Stephen Curry and Klay Thompson strengthened their status as the best outside-shooting duo in the NBA, the offense as a whole often became stagnant and went away from its strengths, especially when eschewing the pick-and-roll. With versatile players like Andre Iguodala, David Lee, Draymond Green, and Andrew Bogut in the lineup, there's no glaring reason why Golden State can't become a better offensive team. Failure to do so would be the clearest sign that Kerr did not have a particularly impressive first season in Oakland. Then again, it's not entirely clear how Kerr and the franchise will define success. Is it enough for him to set the team on a course toward achieving the results that Jackson didn't, or will he need to exceed them now? It's not necessarily prudent to set such rigid standards before the team even plays a regular-season game. Nevertheless, controversial coaching changes require fairly exacting analysis. The outcome of such gambles reflect upon the franchise well beyond win-loss record. A coach pit himself and his team against the world, winning a few battles and losing the war. The answer to this question depends largely on your belief in Kerr and his abilities relative to those of Jackson. As previously noted, those opinions will vary and can't be discussed with any certainty for at least a few months. If we stick to the roster, then the Warriors should be a little better. For one thing, they lost only Jermaine O'Neal, a quality reserve big man who missed several months and may be of limited use at 36 years old. They added Shaun Livingston as a much-needed backup point guard who can defend bigger guards when teamed with Curry; Brandon Rush, who performed well with Golden State as a reserve wing in 2011-12; and Leandro Barbosa, unlikely to match his years in Phoenix but still a speedy guard with explosive tendencies. Plus, reserve center Festus Ezeli returns after missing all of last season with a knee injury. Livingston is still iffy for opening night, but when he's in the lineup he will give the Warriors options that they lacked last season. Though not the world's most adept floor leader, Livingston can contribute in many areas (8.3 points, 3.2 rebounds, 3.2 assists, and 1.2 steals in 26 minutes per game for the Brooklyn Nets in 2013-14) while freeing up other members of the team to excel. The Warriors lacked playmakers other than Curry and Iguodala, and they figure to be heavily dependent on those two for the same qualities this year. But Livingston provides some cover for a team that can use the help. The Warriors have a very good defense, but it has become fairly apparent that their ceiling depends on the continued health of Bogut. Unfortunately, the 10-season veteran seems to attract major injuries and has missed 56 games in his two full seasons with the Warriors (he was traded while already out for the year), plus last spring's series against the Los Angeles Clippers. It's not crazy to suggest that the team could have turned that surprising seven-game series into an upset with their defensive linchpin and chief agitator in the lineup. Add in the continued worries surrounding Curry's ankles (which, to be fair, have held up pretty well for a few seasons) and the Warriors have reason to think they're one major injury away from adjusting their goals. Harrison Barnes looked like a potential star as a rookie, serving up plenty of highlights and six 19-points-or-better performances in 12 playoff games. His sophomore campaign was less successful, with his PER dipping to 9.8 (down from just 11, for what it's worth) and his shooting percentage falling below 40 percent. It's possible that expectations were too high for Barnes, but the Warriors continue to put faith in him as if those projections were sensible. Barnes could very well start ahead of Iguodala to begin the regular season — a good idea, if it goes as hoped — and has the talent to excel. Unfortunately, he can also look too deliberate, maybe even stilted. Barnes can turn things around, but this could be the last season in which he can convince the Warriors that he's an essential part of the future. Thompson is coming off a stellar season with Golden State, a gold-medal summer for Team USA, and contract negotiations that suggest he will receive a max-level deal next offseason. But nothing did more for his reputation over the past few months than the fact that the Warriors decided not to include him in a trade for Kevin Love. If he's too good to deal for one of the league's most productive players, then Thompson would figure to be headed for big things. That's the idea, at least. In reality, Thompson can be a frustrating player — he isn't much of a passer and can sometimes be seen looking off Curry on the perimeter when his fellow sharpshooter has a better shot. 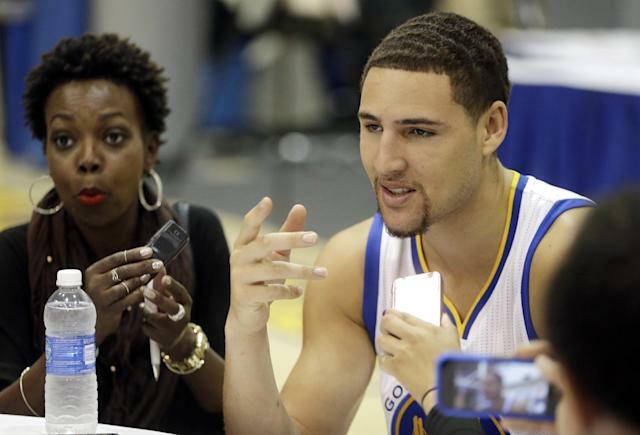 But Thompson is not so far from becoming the players the Warriors think he can be. He's already one of the best two-way guards in the NBA, and his offensive game shows signs of expansion. It would not be a huge shock to see him perform better under Kerr and even make a push for All-Star consideration. Bogut stays healthy, Curry stays an All-Star, Thompson joins him, Barnes finds consistent success, Kerr fits it all together as well as possible, and the Warriors emerge from a crowded field of contenders to win the West. Bogut misses extended time, Curry sees the return of his ankle woes, Thompson makes everyone doubt the Love decision, Barnes falls apart completely, Iguodala starts a downturn, Kerr proves to be a poor coach, and the Warriors miss out on the playoffs in a very disappointing year. 56-26, 4th in the West and the franchise's best record since 1975-76.